I am in the beach resort and port town of Qingdao, well known for its beer brand in China. The reason for my visit is the 2014 Horticultural Exposition, which was opened with great fanfare today. INBAR has joined the Qingdao Expo to highlight the role that bamboo plays from a horticultural perspective. Celebrations started yesterday evening with a gala dinner, where I was joined by the Ambassadors of two of our member countries, Madagascar and Nepal. Today was the formal opening of the Expo, and beautiful weather with sunshine and a slight breeze allowed the ceremony to take place in full glory. There were hundreds of invited guests, from many corners of the world and a good number of Chinese VIPs as well. I sat next to Vice Minister Zhang Yongli from the State Forest Administration, INBAR’s host agency and a great supporter of bamboo and rattan. 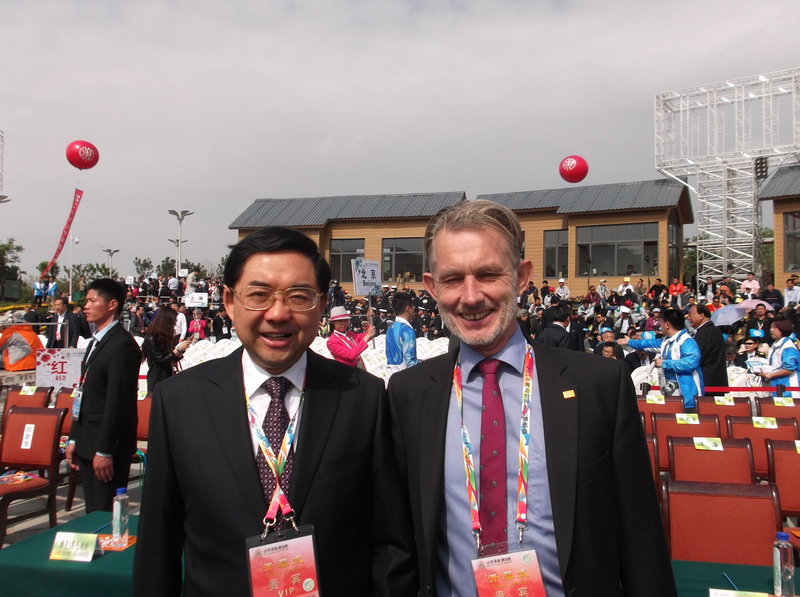 Vice Minister Zhang and I enjoyed the preparations before the actual ceremony started. The opening was a very well-orchestrated fanfare of music, dance and speeches, with the official flag raising ceremony as well. Individual Chinese singers provided leading music pieces, while a large choir helped to provide the background music. There were dancers in traditional costume, there was a children’s choir, and we had clowns and balloons. 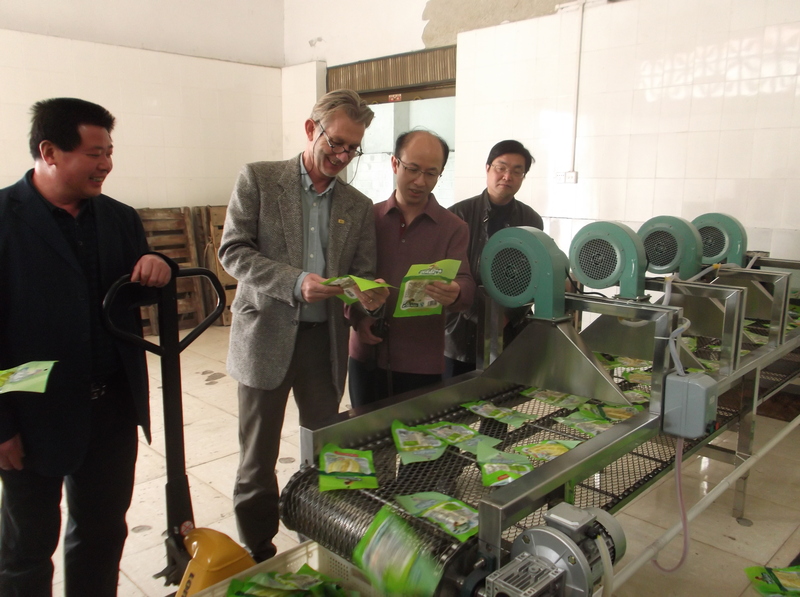 Speakers included the Vice-Chair of the INBAR Board, Professor Jiang Zehui, and the Secretary-General of the International Association of Horticultural Producers (AIPH), Tim Briercliffe from the UK. When the speeches ended, the organisers released more than 100 doves, who flew overhead to provide a fetching finale to the opening ceremony. After the official ceremony was concluded, I went to the INBAR Garden to wait for some of the VIP guests, and was very impressed with what has been achieved during the past year of planning and construction. The garden is well laid out, and has 22 species of bamboo from all over China. Bamboo is used to aerate a small stream, to show how manmade wetlands can help with water treatment. We had arranged for s music ensemble that plays on instruments made from bamboo to provide a nice atmosphere. The garden has wooden decking everywhere, which is made from engineered bamboo; there is a traditional bamboo house made from round bamboo, and a modern showroom with many bamboo and rattan products, as well as a bridge made from rattan. My colleague Dr Fu Jinhe told me that the bridge is one of the most photographed places in the garden. . In the afternoon, I had the opportunity to see a few other places. 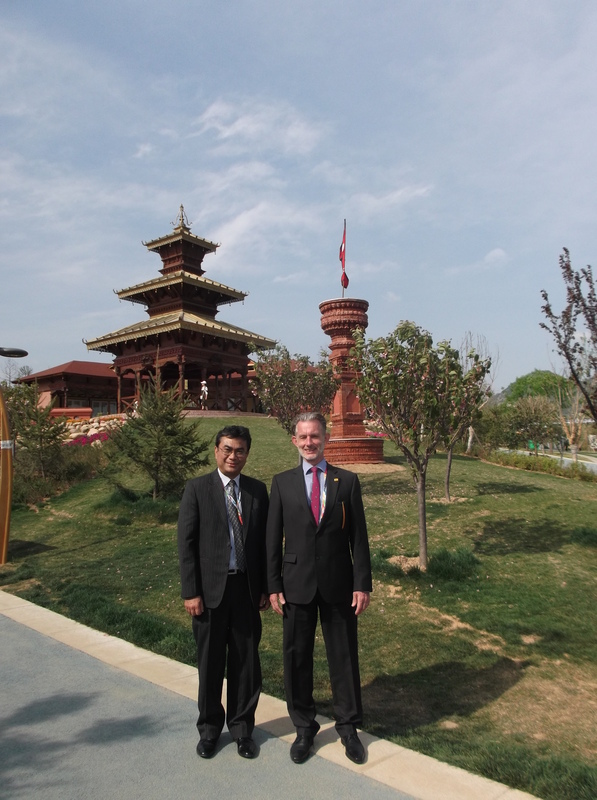 I attended a ceremony at the Dutch garden, and accompanied the Ambassador of Nepal to China, Mr Mahesh Kumar Maskey, to the Nepal pavilion. Tomorrow is the official opening of the INBAR Garden, so more news from Qingdao tomorrow. When I was young, I used to visit the Biesbosch, a large area of coastal wetlands in the southwest of the Netherlands. One of the traditional crafts from this part of the country was weaving baskets from young flexible willow branches. This is not a true NTFP, although the way willows are coppiced, allows them to continue growing. 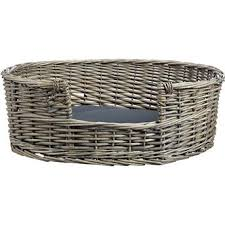 We had a large basket for washing at home and our dog slept in a willow dog basket. Weaving baskets from willow branches is an old craft in the coastal wetlands of Europe, but due to high labour costs it is no longer economically viable in the Netherlands. Some master weavers still practice the trade for educational purposes, and in order to maintain a cultural heritage, and there are enterprises that have combines traditional basket weaving with other more general weaving of screens and partitions. During my University Studies in the UK, I was fortunate to be invited to join the 1987 Royal Geographical Society expedition to Gunung Mulu in Sarawak, Malaysia. A few years later, I went back to the same place, as a member of the British-Malaysian Speleological exploration team that discovered the largest underground chamber in the world. 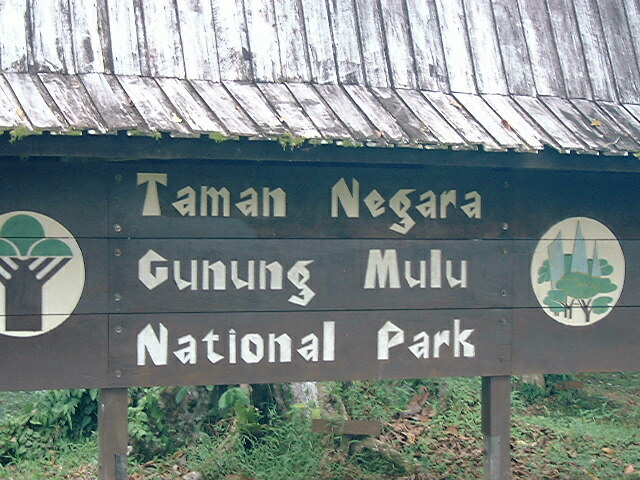 The limestone mountains are now the Gunung Mulu National Park, a place well worth visiting. During the expeditions, we were sometimes invited to the local longhouse to exchange ideas, and to cement our relationships with the Berawan people that traditionally lived in the area. During these visits, I admired the beautiful weaving examples, and I found out that this is a trade that is particularly well developed in Indonesia and Malaysia. Baskets, mats and wall hangings are made with exquisite patterns and colour combinations, using natural rattan fibres. 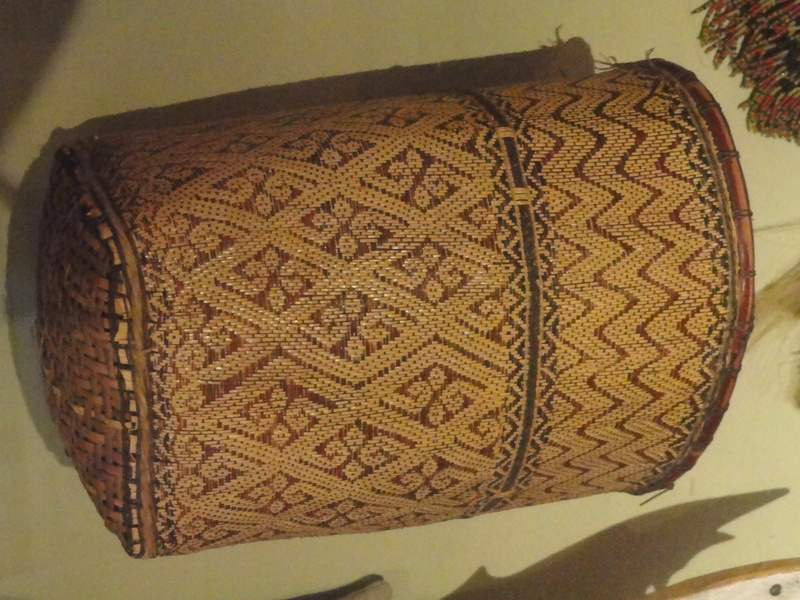 According to the Sarawak Museum, weaving and plaiting baskets isn’t just for convenience. In the Iban community for example, the ability to plait fine baskets would enhance the standing of a woman within the community. The baskets and other plaited items are made in their own design and technique that represents the ethnic identity. The following photo is an example that is kept in the Peabody Museum of Harvard University. 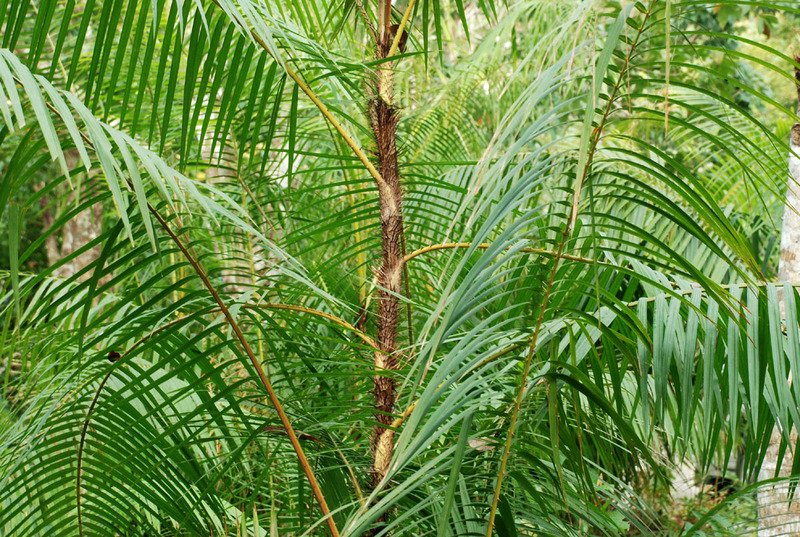 Rattan is the name for the roughly 600 species of palms in the genera Calamus, Daemonorops, and Korthalsia climbing palms of tropical Asia, all belonging to the family Palmae (palm family). Most rattans grow in Indonesia and neighbouring countries, although they are also found in Africa. Rattans are threatened with overexploitation, as harvesters are cutting stems too young and reducing their ability to re-sprout. Unlike bamboo, rattan requires a long time to regenerate, and unsustainable harvesting of rattan leads to forest degradation, affecting overall forest ecosystem services, and this is a serious problem also recognised by the weavers. 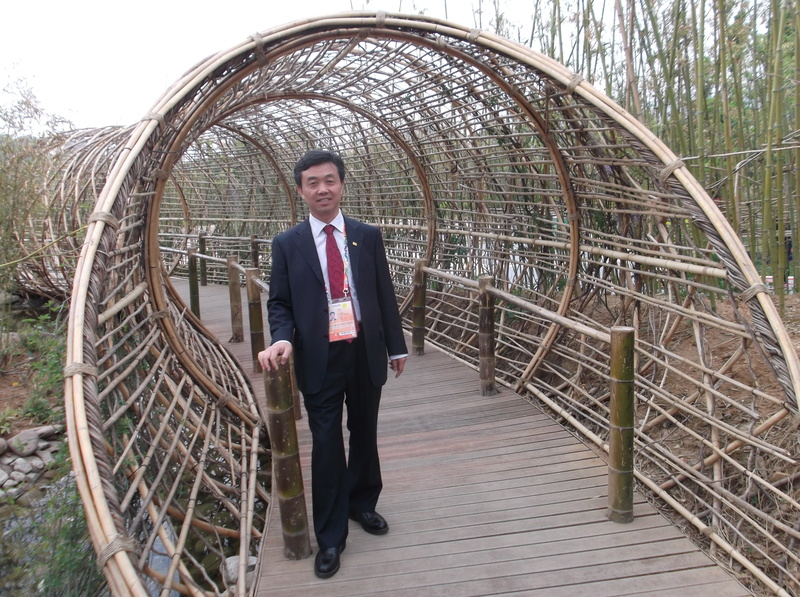 In my current position of Director-General of the International Network for Bamboo and Rattan, I am planning to develop a programme of activities for sustainable rattan management in partnership with our members that produce rattan. We are not alone, and will be working with other organisations that are promoting similar work. I will report on progress in this area later this year. When I moved to Botswana in the early eighties, I discovered the basket weavers from Etsha in the Okavango Delta. They are true master weavers as well, using the leaves of another palm tree – the Mokola (Hyphaene petersiana) that grows in the Okavango Delta – and produce pieces of art. I bought several baskets during an interior design exhibition in Serowe in 1985, and have carried them around the world. Commercialisation of the basket industry in the Okavango has led to changes in the population structure of the palms, but the Ngamiland Basket Weavers Trust, a local association set up mainly by women from the area is planting new trees to ensure a sustainable supply of raw materials. 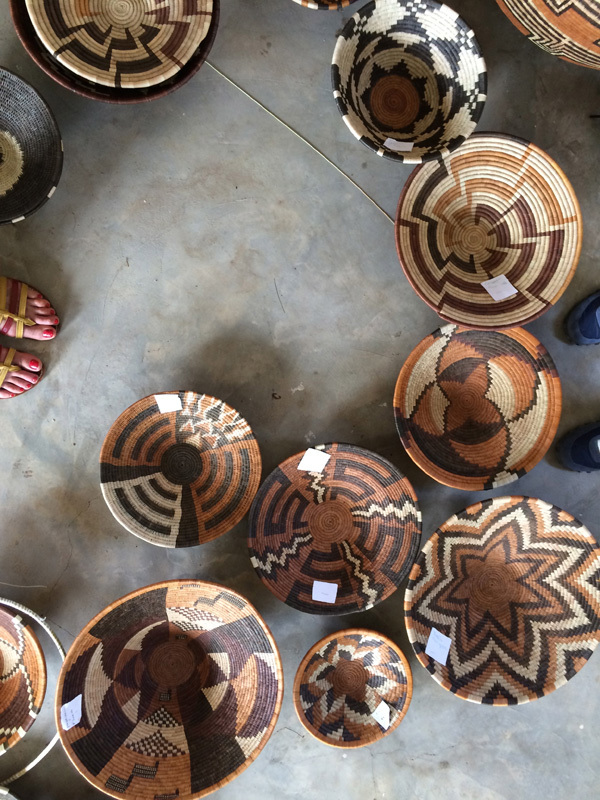 A private company Botswanacraft is also selling Botswana baskets from the master weavers in Etsha, and they fetch at least several hundred dollars per piece. Now, I live in China and a few weeks ago I visited Qingsheng County in Sichuan Province in southern China. Master weaver Zhang showed us what he can do with bamboo! 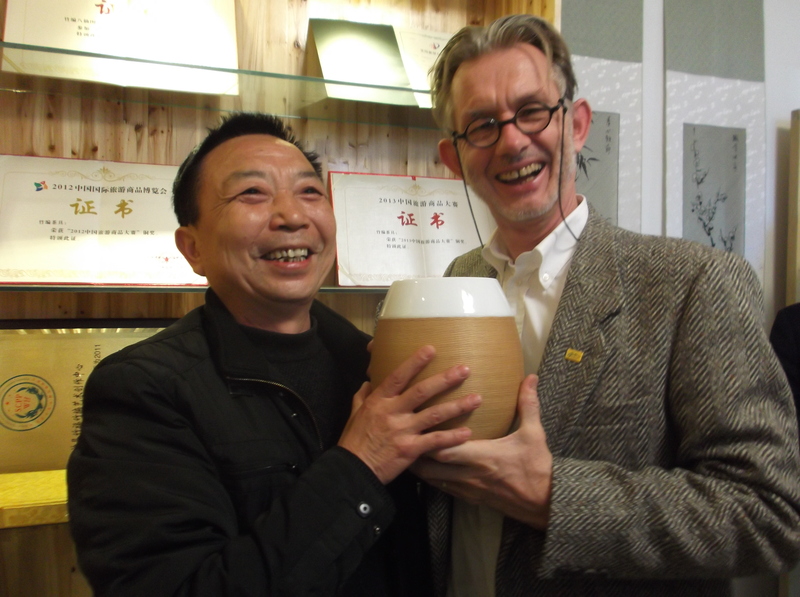 He makes the finest woven covers for porcelain vases and pots, some of which are sold to exclusive addresses in Europe. The photo below shows Master Zhang and me admiring one of his creations. Master weaver Zhang also teaches local people how to make woven paintings, using different colours of bamboo strands. The strands are hand-produced, by splitting bamboo into small strips, which are then separated into 10 layers. These thin layers are again split into even thinner strands of bamboo, and they are used to make the intricate weavings. I have been fortunate to see master weavers in action in several countries, and they all use Non-Timber Forest Products. The NTFP Global Partnership Programme may be able to find other masters weavers, or maybe you know of some. I would love to get in touch with them. Last week I saw for the first time in my life a bamboo shoot appear above ground. 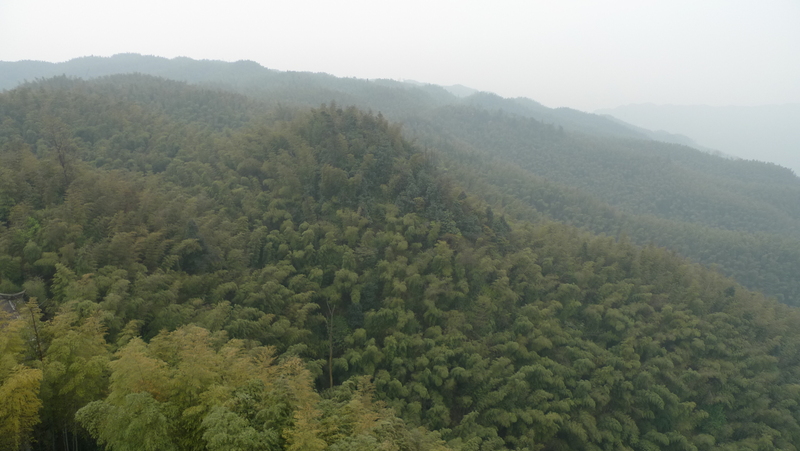 I was in Changning County of Sichuan Province in southwestern China, on the edge of the so-called bamboo sea. The bamboo Sea is a large area of bamboo forest, mainly Moso bamboo (Phyllostachys pubescens), stretching as far as the eye can see. Moso bamboo is a monopodial bamboo, which means that its roots and rhizomes spread out over a large area, reportedly up to 100 metres. The rhizomes create nodes which produce the new shoots. This happens every two years in spring for moso bamboo, while shooting happens for every year for other bamboo, and the month of March is normally the time when the new shoots start to appear. New shoots grow quickly and after a short periods, the growth can reach speeds of one metre per day. After one month or so, the new culm is complete in its height and diameter growth, but it needs a few more years to harden before it can be harvested. New shoots are bullet shaped, and the outside is furry, possibly to make it easy to push through the soil. There are new shoots every other metre, and apparently there will be as many shoots as there are culms per hectare. Changning county has made bamboo shoot production its niche market, and many bamboo plantations and natural bamboo groves in the county are managed for bamboo shoots. I enquired whether cutting the new shoots off to process them for food slows down the regeneration of the bamboo forest, but my colleagues explained that the opposite is true. Out of every thousand new shoots, about 500 will naturally die, due to competition for nutrition and space. Half the new shoots can therefore be harvested, giving the other half more chance to survive. Moreover, nodes where the new shoot has been cut off sometimes re-grow a second shoot, and therefore more new shoots will re-appear after a few weeks. Therefore it is acceptable to harvest even more than 50% of the new shoots every year. The harvested shoots are boiled, and put in large vats with preservative agents, until they are cut up, and packaged for sale. I visited a medium-sized enterprise in town that is making good business from this particular use of bamboo. INBAR has worked with the owner of this company to try and improve the environmental aspects of the production, and look for ways to reduce preservatives and water use and potential water pollution. This is a challenge for any new business, and lessons learned from this particular company can be transferred to other similar activities. 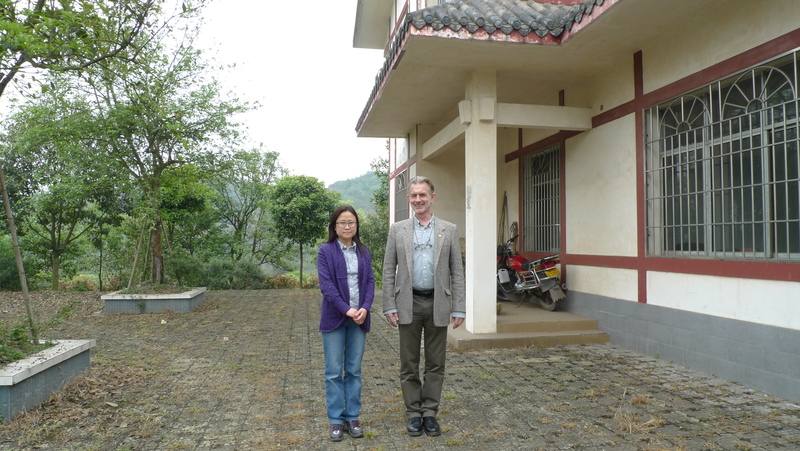 That is one of the objectives of the INBAR-supported SME Training Centre in Changning, which is being developed with assistance from Citi Foundation and EU funded Switch Asia Programme for sustainable consumption and production. We visited the building that will be transformed in a training facility during the coming months. It is located inside a large nursery, and will be a fantastic centre for learning and knowledge transfer. 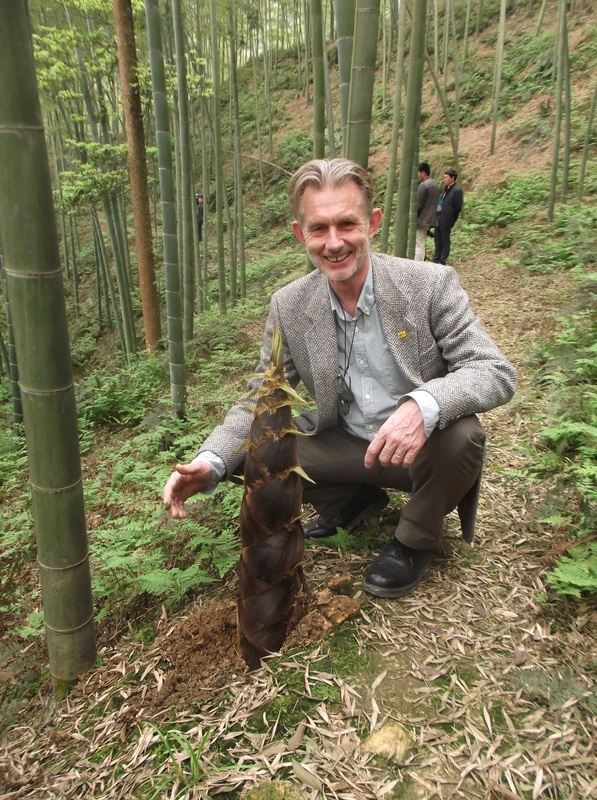 More business training, improved technical knowledge and a better understanding of the ecology of bamboo will give a boost to the economic development of the bamboo resources, especially support to an expanding bamboo shoot business. The good thing is that bamboo shoot production does not harm the forest, as this is an industry that is a positive example of green development.